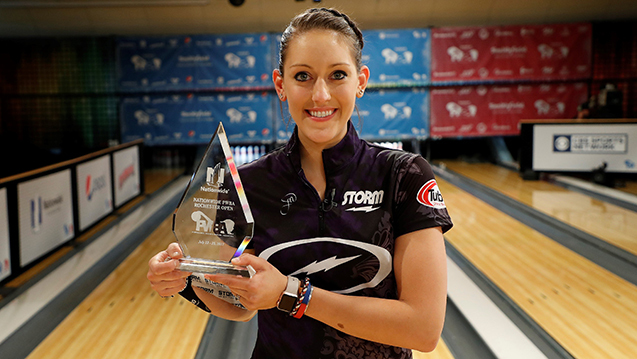 It was awesome to have a PWBA stop in New York, my home state. Even though Rochester isn't very close to where I live, I grew up bowling high school and other state tournaments all over the state. Therefore, I found myself constantly bumping into people that started conversations with phrases such as "I haven't seen you since high school" at this tournament. They may have been off weeks for the PWBA tour, but they haven't been off weeks for me by any means. I just got home from traveling to Sweden for the World Bowling Tour event. I now will have 3 days to get back on this time zone, get some good quality practice days on the lanes and in the gym and then it's off to Richmond! Over the last few years, I've competed on the PWBA tour, the PBA tour, the World Bowling Tour, as well as represent Team USA in multiple international competitions. Therefore, there is really no off season for me. As soon as the PWBA Tour Championship wraps up, I will be training with Team USA and will then go right into another World Bowling Tour event in Thailand. The rest of the year will then be spent competing against the guys! If your goal is to compete on the highest level on either tour - set a game plan on how to get there and work hard every day for it. I love flying and I love airports. It's just recently become a new obsession- 100% related to my travel schedule over the last few years. In addition to constantly booking flights, I find myself doing research and reading tons of articles and blogs on different planes, airports and everything that has to do with travel. If you ever have any questions about seats on different aircrafts, fare classes, upgrades, the best places to eat in any given airport or the best way to argue with airline representatives, I can definitely help you out!